On January 4, 2015 a Full Moon lights the way as 114th US Congress members saunter toward Capitol Hill to meet in session on Tuesday January 6, 2015. By then, the Capricorn Sun will team with a dramatic Leo Moon, a dictatorial blend of energies suitable for what I call the 'Full Moon' Congress of 2015 with its 'Revolution Rocks the Boat' vibes of regime change that threaten to transmute the very identity of the venerable, traditional institution (Sun conjunct Pluto opposing We the People's Moon across the 4/10 axis: awareness, fulfillment, culmination of career and security objectives). The January 4th Full Moon issues from the prominent 'World Stage' New Moon of December 21, 2014--Winter Solstice--@00Cap06 which will have germinated plans and projects toward fuller flowering at the January 4, 2015 Full Moon; this cosmic imprint will affect the entire year and for two years, describes the 114th Congress. 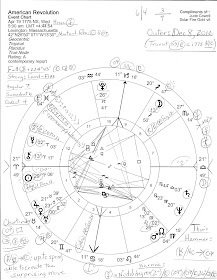 The Pluto-Chiron midpoint (plutocracy, oppression, primal violence, Capitalism, Communism, Bolshevikism, Nazism, National Zionism, White Aryanism, Socialism, and more -isms than we can shake a stick at) is active in both the New Moon and Full Moon horoscopes and if you look at the chart shown below, you see Pluto-Chiron conjoins the 5th house of Risk-Taking and Speculation @13AQ02/37. Actually, Pluto, Chiron, and the 5th cusp are all at 13 degrees suggesting that a fated or karmic condition is involved--possibly an ancient one at that. Naturally, the Winter Solstice 2014 horoscope is important in considerations concerning the 114th Congress, at least until Spring Equinox (Aries Ingress) in March 2015, an Equinox which will be imprinted by a New Moon @29Pis27--a Solar Eclipse. Though it isn't marked on the chart, at Midheaven (MC = Aspirations) are nestled America's natal planets in Cancer (5--14 degrees). The 10th house Moon exalted in her own sign conjoins US natal Sun and Sirius (Alpha Canis Major: the shining one; the scorcher; the fire of immortality). Sirius is the star-goddess venerated by several ancient cultures and active in the founding of America, thanks to our nation's Freemason-Rosicrucian-Illuminati founders who were, it turns out the more I study them, feminine goddess worshipers rather than Christian believers--'Deists' as they are often called in an attempt to make their true allegiances and ultimate goals more palatable to the public. Even the 10 x 10 shape of The District of Columbia--a diamond laid out by George Washington--is an archetypal symbol of Venus, and Sirius is the Star of Isis. Since Sirius may signify 'great deeds' (Brady), perhaps in 2015 the American people will shake off the politically engineered apathy that assails us and act on behalf of ourselves for a change because I doubt that the changes the GOP have in mind are what most of the public will desire or wish to accept (exs: Medicare vouchers, more dissolution of US sovereignty, lower corporate taxes, fatter political donations, additional banking bailouts on the backs of taxpayers as Wall Street gambles again and crashes the economy, expanded wars, less privacy, less health insurance coverage, more racist legislation, etc.) Plus, a Full Moon conjunct US natal Sun (the president) suggests that a majority of the public is more in tune with White House aims (as they are stated) than with GOP austerity measures which are punitive for us, liberating for corporations and others of the power elite class who have ensnared most of life's advantages as it is--at our expense. And so I have entitled the Full Moon of Congress 2015 horoscope, "Revolution Rocks the Boat" even though the Uranus-NN = Pluto midpoint picture suggests that billionaire backers (supra-national bankers), plutocrats, and secret society types intend to do the rocking via political action, obstructionism, and propaganda campaigns. 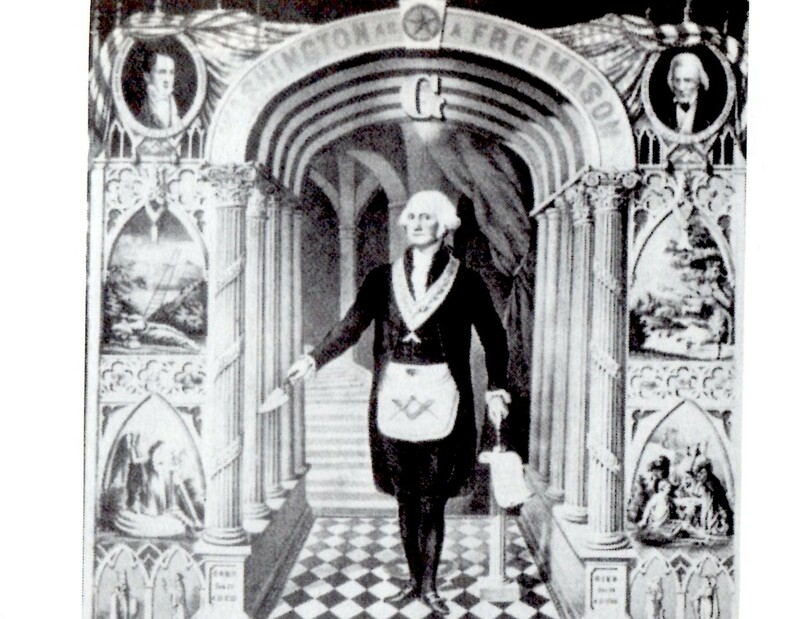 Few can now deny that 'Total Awareness' and control are their goals which are reflected by the first Full Moon of 2015 spotlighting the Cancer-Capricorn axis of Security and Control with Capricorn the Saturn-ruled sign of government, law, and business--at IC, the Foundation or Basis of the chart and of the 114th Congress. And if you enlarge the horoscope you may wish to read (lower left) a few notes concerning the ongoing transit of Uranus opposing US natal Saturn with its 'new order replaces old' connotation seen in part by this Full Moon Congress horoscope, the first lunation of 2015. Please note that this SO'W post and all others are written from my populist viewpoint and in light of my considered opinion that the 'R v D' ploy is meant to divide and conquer (and weaken) the American people with pointless diversions while hiding the true nature and intent of the 'ruling class' as its members follow the globalist script. They play a 'power game with important consequences' so I look at what actually results from their theatrics rather than at what any politicians say, promise, legislate, or tout. By their fruits ye shall know them. Now as you know, Cancer is a subjective, self-protective, nurturing placement for the compassionate Moon and reflects the 'reigning needs' and the mood of The People as 2015 begins--and that means all of us, including the less fortunate. These needs must not be allowed to be ignored or neglected by members of the Republican-led 114th Congress of neo-con hawks and Vulcans of war who are anti-government and anti-democracy. Perhaps the man intended to be the people's standard-bearer, the president, will help staunch the Republican tide about to roll over and capsize our already-leaky boat (which includes our social safety net). After all, in the Foundation 4th house of the chart, you see Mercury @00AQ14 along with Venus (1:59) which times transits of both planets to the US Inaugural Sun--the Office of the President. Mercury to Sun denotes willpower and communications being used to promote goals along with an originality that can win the day. We're already seeing this condition in President Obama's immigration initiative, the normalization of diplomatic relations with Cuba, and other endeavors. Attracting Venus conjoining Sun adds charm, popularity, easy relationships, and perhaps smaller amounts of money yet both planets are about to oppose Barack Obama's natal Mercury in Leo which on another level describes those who oppose his ideas and plans as Republican rudeness and spite continue. (Edit 2.10.15: Venus in this chart may also represent such figures as Hillary Clinton and Elizabeth Warren as well as other feminine politicos--see more about Venus, below). In addition, moneybags Jupiter in Leo is retrograde (11th house of Groups) which partially describes the anti-Obama contrariness of Republicans determined to financially stop or delay the president's initiatives from going forward--and this includes 'Obamacare'. Banker Jupiter's path into 2015 has been previously discussed if you'd care for a look. Yes, Jupiter the General, the Guru, the Professor (as in, Prof. Jonathan 'foot in mouth' Gruber), the Corporatist--the Jolly One's roles are varied and his Rx periods tend to stall plans and activities on several levels. 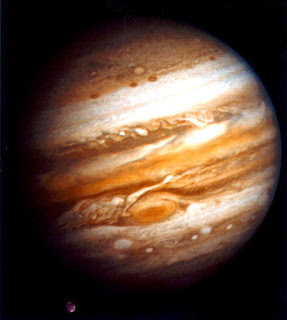 Yet perhaps Jupiter Rx denotes that the continuing stalemate between the White house and Congress will be more evenly matched than a new Congress (un)balanced toward the GOP suggests. In Sun-ruled Leo, ego-driven plans for expansion and investment are under close scrutiny by critics including broadcasters (another of Jupiter's roles) especially around April 8, 2015 and not letting up until after July 2015. Among others, #POTUS will be broadcasting from the Bully Pulpit in order to get his points across to the public while circumventing his opponents' blocking efforts. Now it's usual in a horoscope to find the Ascendant and Midheaven squaring one another and they act, of course, as places for planetary energies to express. Yet if we wish to gain a bit more insight into what's up with activist Mars in Aquarius (5th house), we find that the warrior planet is apex of a pattern some call a 'Thor's Hammer' (or, 'Fist of God') and this condition depends on the meaning of the ASC-MC midpoint with potentials for: lessening the quality of life, a lack of common or shared goals, leaders who guide through periodic cycles of expansion and contraction, and/or exclusion of racial groups (Munkasey). With Mars as catalyst, this yields a fighters who demand appreciation as they attempt to protect themselves against threats to their lifestyles. Of course, this picture may also describe well-heeled individuals who never seem to hoard enough wealth or resources--and testy Mars isn't known for his sharing qualities, is he? Now I have yet to mention the titanic power struggle seen in the Cardinal Grand Cross between North Node, Ascendant, Moon, MC, Sun, Pluto, and Uranus/South Node and which hinges upon the Full Moon, the Nodal Axis (Past and Future direction), the MC (the Goal Point), and the continuing generational conflict of the Cardinal Square of Utopian Uranus and powerful manipulator, Pluto. Civil Rights issues continue to be front and center within their Cardinal Square as 1960s legislative progress is under fire. 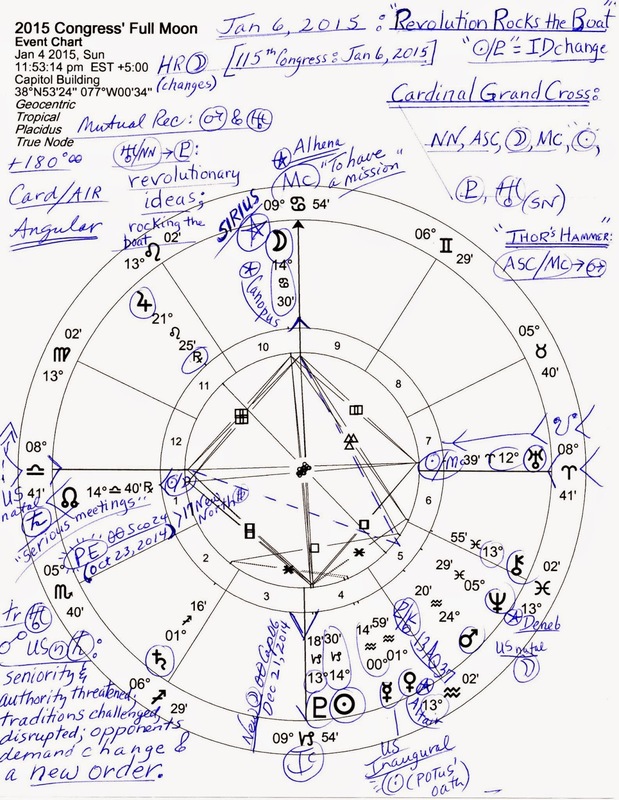 Also described, the White House v Congress turbulence; the Cross creates several midpoint pictures which you may wish to consider such as the one I penned on the chart and already mentioned, Uranus-NN (radical political groups) = Pluto (the Hidden Hand, plutocrats, saboteurs, etc). Why, just the Pluto opposing US natal Sun transit is enough to describe the power struggles and challenges the president has been facing. Also prominent in the Full Moon chart as an indicator of good fortune is the 1st house North Node (NN) @14Lib40 which now joins US natal Saturn (lawmakers, judges, managers, our Founding Documents) @14Lib48 and shows that serious meetings are taking place. Though it may suggest limitations on the 'good fortune' of NN in 1st house, Saturn-NN also denotes longstanding ties, foreign enterprises that offer assistance, and/or new alliances forming (Munkasey). Given current conditions in the US, this duo may also point to an encounter (NN) with our national 10th house Saturn, a 'fall from grace' placement that indicates the breach of public contract and neglect of responsibilities and accountability being practiced by many politicians, along with the longstanding determination of certain entities to undermine and collapse the US government and thus control America's direction as global cop and enforcer for a 'new world order' as mentioned and penned on the chart concerning disruptive Uranus in Aries opposing US natal Saturn in Libra. 5th house Mars @24AQ20 conjoins or nears (depending on which US natal chart you prefer) US natal Moon which denotes that the public is very busy as 2015 begins and may act from feelings of anger; our domestic activities are hectic or at least, energetic. In Aquarius, planet Mars loves to reform and here opposes Jupiter Rx though the aspect is separating (2S55) suggesting events and conditions that have already taken place prior to the January 6th Full Moon. This Moon-Mars and setting-Uranus condition may herald more of the public's break with Tea Party politicians such as gasbag Ted "Green Eggs" Cruz--and his Party's rather obvious lack of appreciation for his egoistic efforts. Oddly, the first chart consideration has so far been neglected by yours truly and that is Venus as chart ruler (and thus, 114th Congress ruler) and any applying Ptolemaic (major) aspects formed with other planets in the chart. Application of the chart ruler hints at how things will proceed from the January 4th Full Moon, a lunar phase denoting that what was primarily felt in the past is now seen (Rudhyar). On one level this describes the current Republican coup of House and Senate as of November 2014. Yet some political pundits say President Obama has been energized or liberated by this new condition--we shall see as 2015 gets underway. Now as you see, 4th house Venus is posited in humanitarian Aquarius near US Inaugural Sun as noted above, and makes no applying (waxing) aspects to any of the Full Moon planets. 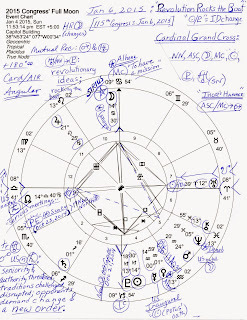 Every planet in this chart is within bounds of the earthly plane so all actors are accounted for and involved yet with the condition of chart-ruler Venus we find that sign and house are emphasized along with the Venus-to-presidential-Sun transit already mentioned. Females and feminine issues are also denoted with any Venus placement. Plus, a 4th house Venus denotes Real Estate Matters, Security Needs, and Domestic Interests along with projects that beautify the environment. This placement also hints at the attractiveness of our nation for Cuban immigrants who finally may visit their relatives in the US. However, their return to Cuba will involve much complexity and such outcomes cannot be known from the January 4, 2015 Full Moon chart since Venus is non-applying but this does suggest that at least some foreign visitors may endeavor to remain in the US (no application from 4th house). Note that besides 1st house, Venus also rules the 8th house of Corporatism, Big Business, Debt, Credit, Insurance, Legacies and Inheritances, the Occult, Transformation, and Death and is part of the National Treasury axis, the 2/8 (Republican blocking of Obama's immigration plans via the purse strings?) and if We the People are enraged at Washington DC politicians for providing Wall Street with additional opportunities to gamble with the US economy and our livelihoods and mortgages while spending tax dollars on waging war which fattens their stock portfolios, we have every right to be--even before the December 2014 'Cromnibus' spending bill of last-minute poison pills was passed. Now on positive levels, Venus in Aquarius signifies potentials for: sponsors who offer protection for those who long for freedom, progressive views concerning relationships, and happy social contacts. Negatively, the placement may also describe those who entertain peculiar plans and ideas (Ebertin) which may not sit well with a majority of the American people for our natal Venus of 1776 is in nurturing Cancer and our Moon is in humanitarian Aquarius. One example of peculiar plans? Shrinking government until it can be drowned in a bath tub, a favorite goal of the tax-cutting, monarchic Republican Party which has apparently derailed their primary debating Clown Car of ridiculous presidential candidates for 2016. Well, their silly displays have served the purpose the last few years of ignoring real issues and solutions for the American people just as their spiteful obstructionism during Democratic presidencies have done. Undermining President Obama's efforts is a deep and guiding obsession for the GOP! It's all part of Washington's Political Theater script, folks! And since the US government is owned by foreign entities who do not have America's best interests at heart, US politicians have no option to do other than follow orders.